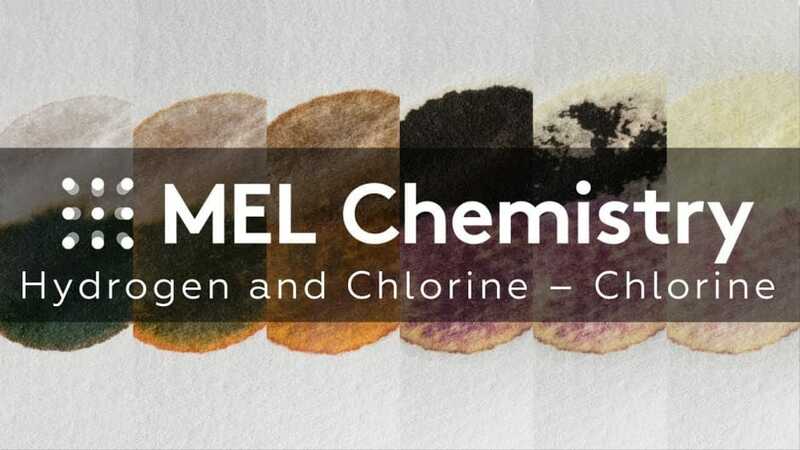 Obtain chlorine and study its chemical properties! This experiment is included into "Hydrogen and Chlorine" kit along with "Hydrogen". 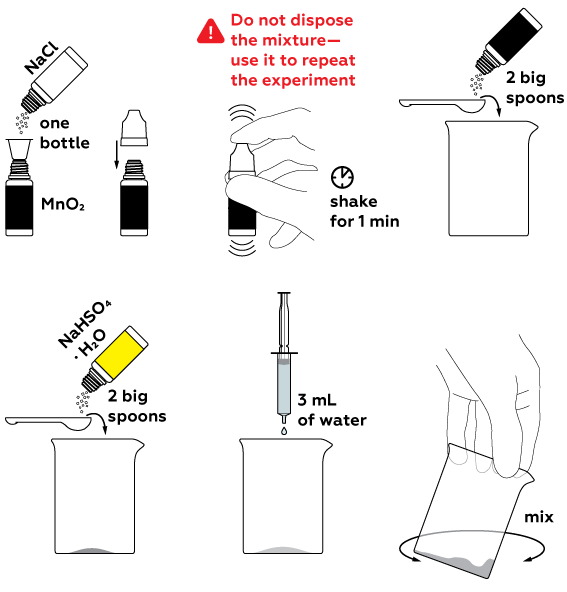 Subscribe and get everything you need to do this experiments at home. Keep a bowl of water nearby while working with fire. 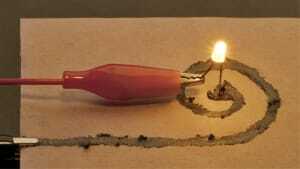 Remove protective gloves before lighting the candles (step 3). Sodium bisulfate aggregated into lumps. How do I measure it now? Break these lumps down with a stirring rod from the set. Keep stirring the salt in the bottle until it becomes homogeneous. I can smell gas when conducting the experiment. Is it dangerous? Indeed, a negligible amount of chlorine is produced in this experiment. The amount of gas released is enough to make you feel the smell but too small to cause any harm to health. Nevertheless, avoid bringing the open glass close to your face to sniff it! 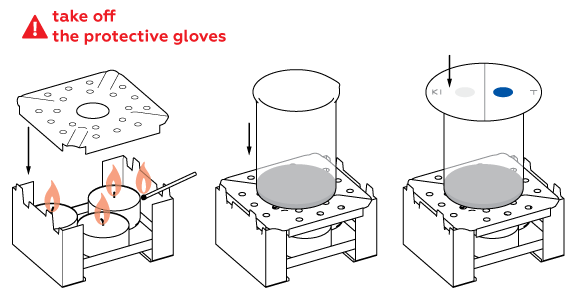 In order to smell any chemical, the proper technique is to waft: move your hand in a sweeping motion over the container with the chemical. This would be enough to bring the scent toward you. Drops of potassium iodide and thymol blue accidentally touched each other. Should I continue the experiment? If the drops do not overlap, you may continue the experiment. If they blended in, however, take a new sheet of filter paper and deposit the drops again. The stain of released iodine doesn’t want to disappear completely (step 5). What should I do? Adjust the filter paper to position the stain away from the edge, right above the chlorine vapors. Make sure all three candles are lit up. 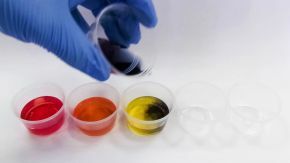 To obtain chlorine Cl2, a number of reagents should be mixed. Firstly, we obtain hydrochloric acid HCl from sodium chloride NaCl with the help of an acidic medium (we create this with the use of NaHSO4). HCl reacts with manganese dioxide MnO2, which yields chlorine Cl2. How can we be sure that we obtained chlorine? Let’s try out two qualitative reactions. Chlorine is a gas, so we’ll conduct these in the drops on filter paper, not inside the beaker. High temperature speeds up the chlorine formation reaction. 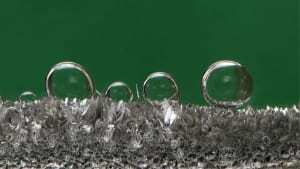 Two processes occur in the drops. In the left one chlorine oxidizes iodine atoms from KI into molecular iodine I2. It has a deep brown color. In the right drop a pH-indicator thymol blue changes its color from blue to orange. This is because the chlorine dissolves in the drop of indicator and forms some acids. Chlorine can oxidize molecular iodine further. Colorless substances are formed in this process, and the brownish color slowly disappears. Meanwhile chlorine gradually oxidizes the thymol blue which becomes colorless. 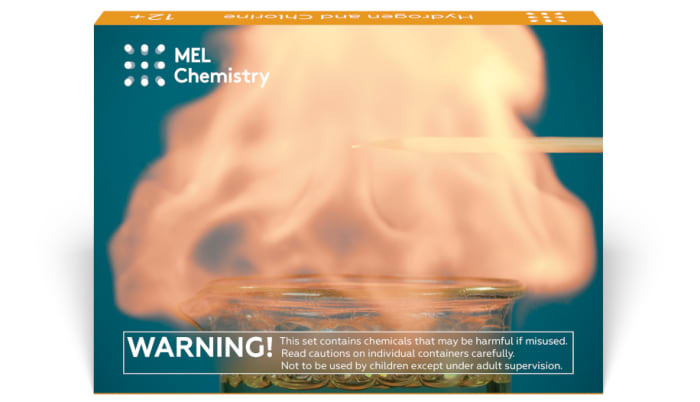 To stop the chlorine formation reaction, extinguish the candles and fill the beaker with water. Wash the beaker thoroughly after it cools down. Chlorine changes the color of the indicator thymol blue and oxidizes iodide into elemental iodine. When manganese dioxide is added to a solution of hydrochloric acid, half of the chlorine ions oxidize and form elemental chlorine, while the others bond with manganese. How is the hydrochloric acid produced that is used in this experiment? Why does the drop of thymol blue solution change from blue to red? This causes the number of the protons to increase. When thymol blue is exposed to a high concentration of protons, its color changes from blue to red. 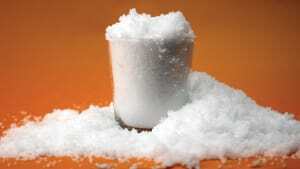 What happens to the solution of potassium iodide? If you look at a modern periodic table, you will notice there are six halogens: fluorine, chlorine, bromine, iodine, astatine and tennessine. As astatine is extremely rare and tenessine is very radioactive with an extremely short life span, the best studied halogens are fluorine, chlorine, bromine and iodine. Fluorine is known to be an extremely reactive element, while iodine can be kept in our first aid kit for quite a long time. This shows us that the reactivity of halogens decreases from fluorine to iodine. 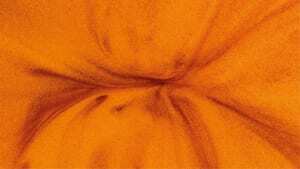 Why do iodine and thymol blue lose their color after some time? Chlorine can also oxidize thymol blue. The oxidized form of thymol blue is colorless, and therefore the drop of thymol blue solution gradually loses its color.